I found a portrait of Salvador Dali on Wikipedia and skeletonized it so I’d have something for my shrine on Friday during the Day of the Dead Festival and Artist Reception at the Red Sable. 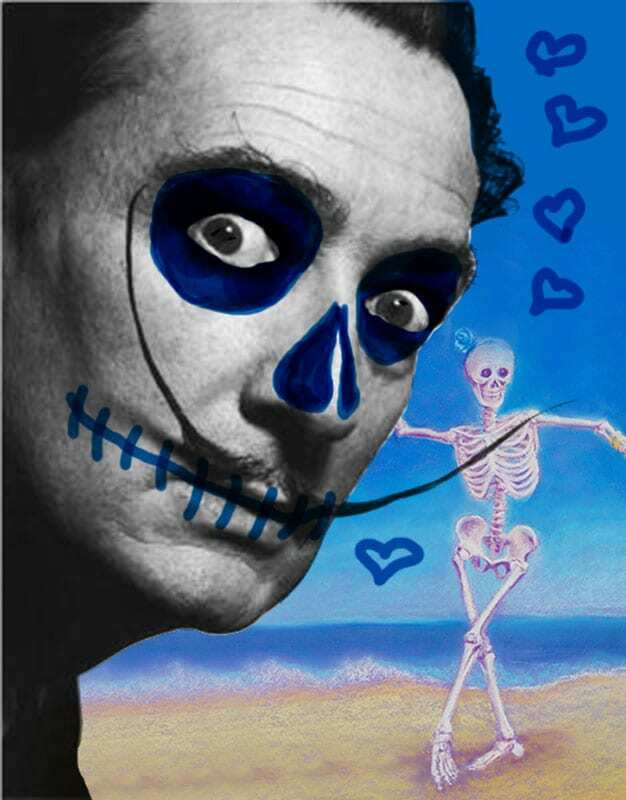 Since Salvador was the inspiration behind the original Skelly Dancers, I added the very first one I ever painted in the background and then I painted in skeleton features over his face in blue and added some hearts, because I love his mustache and his devil-may-care attitude. He was a fantastic painter, a real craftsman. I’ve been to the Dali Museum over in St. Petersburg, Florida. I especially love the large paintings they have. Very wonderful. So I made a shrine for him. I added candles and some bone sprinkles around the picture frame and I’ll have some pretty yellow sunflowers in a vase. You’ve got to have yellow and this is as close as I can get to marigolds. I wouldn’t mind being haunted by Dali’s ghost. I bet he’d have some good advice for me about painting skeletons and throwing parties. I’m off today to get some boxes of wine. A red box and a white box. That should just about cover it. And I have to practice my own sugar skull makeup some time before Friday. Half face? Full face? Happy? Scary? What shall it be? Plus, I wonder who will win the custom sugar skull portrait? Last I checked, there were quite a few names in the box… I’ll be pulling someone’s name out the pile on Friday. Might it be yours? 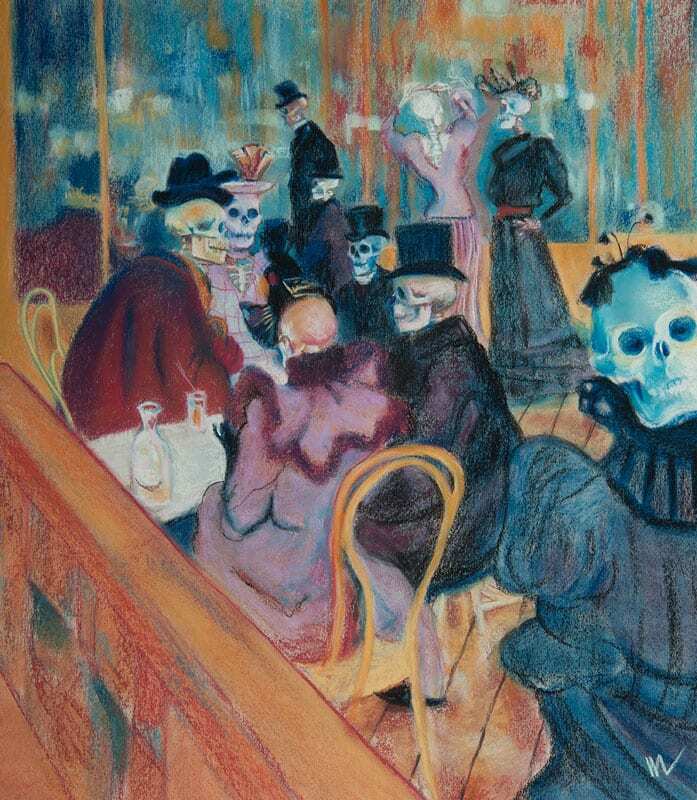 This entry was posted in A pastel a day, Pastels, skeletons, Skelly dancer and tagged artist reception, Salvador Dali, skeleton, skelly show on October 27, 2015 by Marie Marfia.